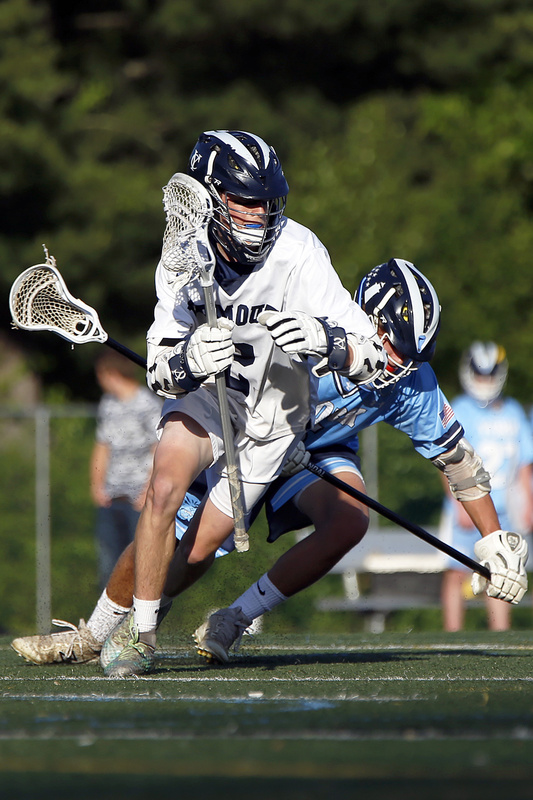 YARMOUTH — Time was on third-seeded Yarmouth’s side Friday night entering the fourth quarter of a Class B boys’ lacrosse quarterfinal. Momentum, however, was with sixth-ranked York. Down by nine goals midway through the third, the Wildcats scored three straight by the end of the quarter. But Yarmouth stayed composed and got the job done, winning 17-10 to advance to the semifinals against No. 2 Brunswick or No. 7 Mt. Ararat. Yarmouth’s Anders Corey looks for room between York defenders Thomas Beecher, left, and Oscar Kwok. The Wildcats (8-5) came alive with five minutes left in the third when Will Masterson scored. Collin Edminster (three goals) and Mark Engholm (four goals) had the next two for York to enter the fourth down 14-8. Silas Chappell snapped York’s run 3:22 into the fourth following a forced turnover. Michael Guertler – a defender who finished with three goals for Yarmouth – scored a minute later to pull the game further out of York’s reach. 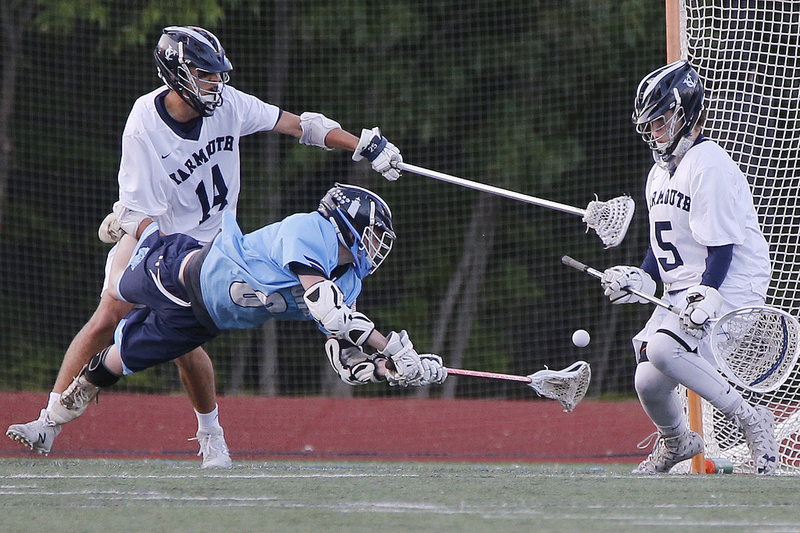 Yarmouth’s Joe Truesdale gains ground as York’s Miles Pavuk stumbles. The Clippers got goals from six players, with Anders Corey scoring five and Cooper May four. Yarmouth (9-4) never trailed, outscoring York 6-2 in the first quarter and 4-2 in the second. Corey kicked off the scoring 43 seconds into the game after the Clippers won the opening faceoff. Engholm answered 1:17 later to tie the score before a pair of Gavin Hamm goals put Yarmouth up 3-1. Yarmouth goalkeeper Spencer King makes the save as York’s Mark Engholm takes a flying shot. Edminster cut the Clippers’ lead to 3-2, tucking his shot just under the crossbar with 4:37 left in the first quarter. 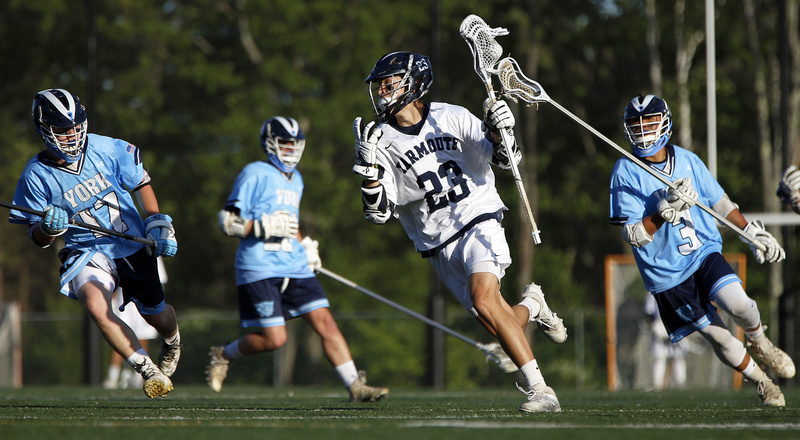 Yarmouth responded with a run that extended into the second quarter, with May scoring four of the Clippers’ six straight goals. 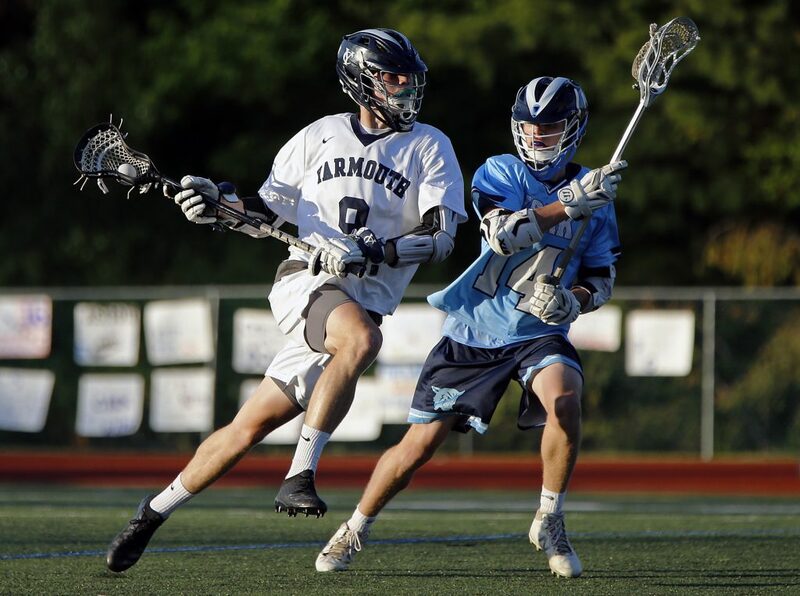 Joe Truesdale also contributed two goals for Yarmouth – with Hamm assisting on one of Truesdale’s in the third quarter, which he scored from behind his back. The Clippers’ win snapped a three-game losing streak – the last two decided in overtime.